I'm very lucky to have a few friends who live quite near by and live a very similar lifestyle. 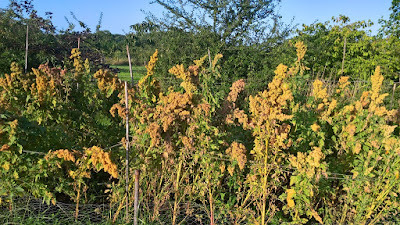 Last year when I was at one friends house I was very impressed with their beautiful quinoa growing in their back paddock, I asked them to take a few pictures so I could post it on the blog and she's written a great description of what they did below. "We planted a 100 square foot bed with about 120 plants. The seeds germinated really easily in the greenhouse in a normal large plug tray. I planted them out when they were between 10-15cm high about a 10 to 12 inch spacing between each plant and row. They didn't need staking but did need protection from cheeky rabbits. Birds will not eat the Quinoa seed as it is coated in saponin so netting overhead isn't needed. I only watered them a couple of times to get established then maybe twice during growing season when weather was really hot for a prolonged period. They were very low maintenance plans. I mulched around the plants with grass cuttings to keep down the weeds. 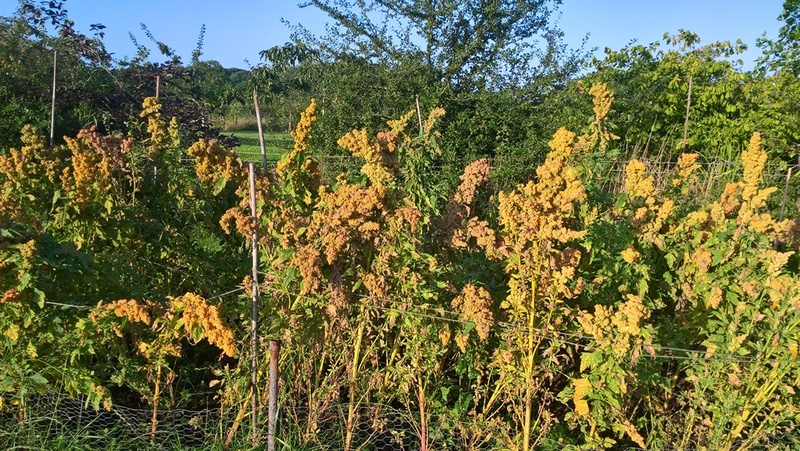 The colours on the Quinoa when it is flowering is stunning - we planted Rainbow Quinoa and had beautiful yellow, orange and red colours throughput the patch. The seeds are ready once the flowers start to die back and colours go dull on the head of the plant. You can tell when the seeds are dry enough because they come out easily when you rub them between your fingers. We harvested ours on 10th September last year. They take around 90 days from planting to harvest. Once we had picked the flower heads we placed them onto a tarp and threshed them with garden canes. The kids absolutely loved this stage. Once we have a nice pile we passed it thought a garden riddle to get large pieces of leaf and stalk out. We then used a very simple system to winnow the grains using an electric fab to blow the chaff away from the seed, letting the clean seed drop into a bowl. We had to repeat this 2-3 times to get clean grain. 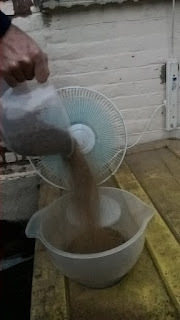 We managed to get 2.5kg of grain from a small patch of very heavy clay soil. I decided I would wash the quinoa before cooking rather than wash the whole harvest then attempt to dry it all out. The quinoa grain needs rinsing in water twice before cooking to get rid of the saponin. I was surprised how easy this was as the grain feels a bit sticky when you handle it. The result was a delicious quinoa that tasted fresher and nuttier than anything I have bought in a shop. A revelation on cooking the quinoa gave amazing results. Use twice as much stock as quinoa, and bring it to the boil then simmer until the quinoa has absorbed all the water (15-20 mins). Once the water is all absorbed, remove the pot from heat, cover it and let the quinoa steam for about 5 minutes." I've long been interested in growing grains and trying to provide some of our staples from the garden, for the last few years I've said I was going to try Quinoa but haven't got round to it or haven't had the veg bed space ready. I've read that it's one of the only grains worth growing on a small scale, especially as maize or corn doesn't grow that well here. 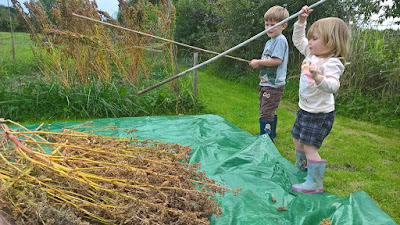 From the look of their harvest it certainly looks like it would be worth some garden space in the future and she's given me with some seed to start my own if I want to. Have you ever grown quinoa or another grain to eat? How did you find it? Was it worth the effort? Is there another grain type crop that yields as well in a small space? Hi Kev :) I'm interested in reading about people's experiences. I've also been quite interested in growing grains - in the future, not here in the rental. I think that I might have success with corn...but then, it will be trial and error down the line. 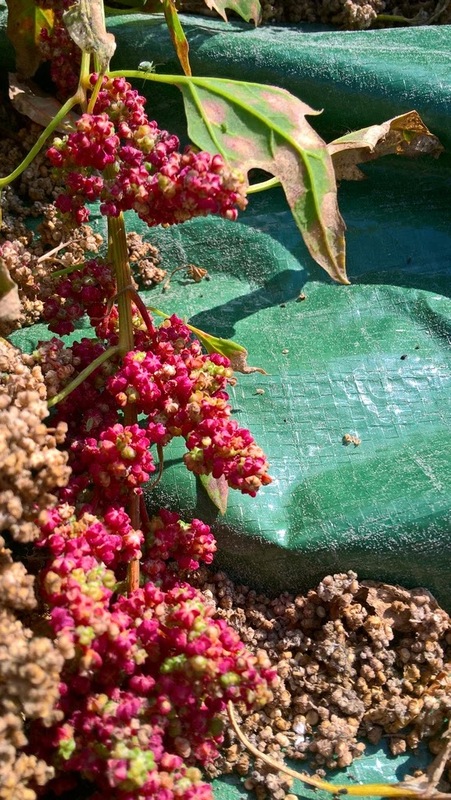 It's a very interesting post about the quinoa! Yeah I was interested by it. I think I might put in a couple of beds with quinoa and see how it does here. don;t be put off because yours is a rental though, Have you watched any of Curtis Stone's videos on YouTube? Everything he does is on rented land. Interesting post Kev. I believe that learning to grow different grains will be important in the future. So do I, and many other differnt crops - Why I've joined the guild of oca breeders as well! I grew it a couple of years ago and the results were pretty meh. 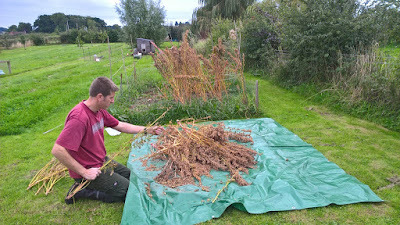 I was growing it for the poultry and there were so many other things (millet) that can give higher yields. I've noticed that a lot of things that are direct sown here are being sown as transplants (grains, peas)? Millet can be used to make flour as well but I'm not sure how that grows here. I direct sow crops later on but when it's cold I tend to start in the greenhouse, last frost date here can be second week in June and first can be as early as late September so the outside season is short. Also by starting everything inside I can get mulitple crops in a bed in a year, the second batch can be growing before the first one is even out of the ground! It grows here in it's wild version but we don't harvest the seeds but rather the young plants are an excellent green vegetable, better than most domestic ones except maybe kale. It comes up all over the garden and most people don't know how good it is and fight it all spring. I need to learn more about weeds I can eat - I certainly have plenty here! Yes, thank you Sarah, that was a great guest post! We do plan to grow more grains this year, so tired of buying bad flour at the store. The quinoa sounds wonderful and doable. "Thrashing" should be a good time for everyone anyway. I have a great place I buy flour from in bulk but I want to grow more of my own staples if I can. Great to get the kids involved in this type of thing as well! I remember reading that millet was easy to grow in the UK - I even saw some seeds for it somewhere recently (RHS Wisley plant shop ???). Millet is tasty cooked as a grain, can be used as porridge or reduced to flour. Barley is probably the original UK grain because it matures is in relatively shorter season than many other grains. Barley is useful in cooking stews, risottos or porridge, but may need more processing to polish the grains. Sadly I can't remember the author of the book I once read about growing grains in gardens (I was thinking about grains on my allotment, but decided I couldn't grow enough to be useful), but it must be out there somewhere. Never tried millet but maybe I should. Processing the grains is the tricky bit and why it works so much better on a larger scale. Barley is tricky to polish and get clean but great as it's the only thing you need to do to it. I'd love to grow oats and you can get hull less but I've also read that the birds get it first. i have a book about it by a guy called Gene Logsdon but I've yet to try to grow anything other than sweetcorn! Quinoa this year for me maybe then try something else next, I have some spelt, barley and wheat seed but not sure about doing it this year! What Type Of Gardener Are You? Extension Progress - Scaffold Down!